Thank you so much for joining us in fighting the war on hunger right here in Winnemucca. We are hoping to create a fun, energetic event that the entire community can take part in. Form at team of coworkers, family &/or friends, and please help us spread the word! • Every team will be given a 10 x 10 space to make your art piece. Please do not exceed 6 feet in height. We can’t be certain that any sculpture is structurally sound, and we would hate someone to get hurt during this event. • There are no regulations on team sizes. The more, the merrier! • Use of colored paper will be allowed to cover the label. This is an option when you need a certain color to complete your art piece and the existing label will not work well. There are a few things to keep in mind, however. First of all, the Food Bank cannot accept any food cans that have torn or missing labels, so please ensure that you will not be damaging the label when you remove the paper. Secondly, we will be judging for certain awards based on creativity and use of labels. Keep that in mind when considering paper. • Each vote is $1, and there are no minimum or maximum vote amounts. Each art sculpture will have their own collection boxes and whomever has the most votes at the end of the night will be the winner of our “People’s Choice” award. • You may use anything to support your structure. Some ideas are thin plywood, foam boards, pvc pipes…etc. The sky is the limit but please keep in mind that we must clean everything up by Sunday. Perhaps cutting pieces of plywood and other materials may be a more suitable task to complete at home or work before the actual event begins. • Each structure can be hollow; however, extra points will be added for using food to fill the voids within your art piece. An example would be to fill your core with bags of pinto beans, or perhaps an entire case of green beans left in the box and wrapper to help with stability. 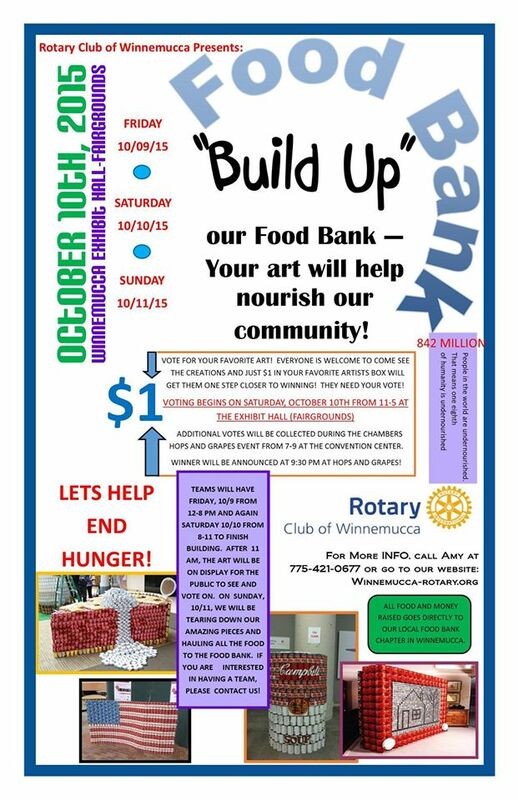 • Teams, along with other volunteers, are expected to help tear down the art sculptures on Sunday and deliver all of the food to the local food bank office. We will have a representative from the food bank on hand to assist with this, but we will need all the help we can get! • And most importantly, HAVE FUN! We know that when things get going, we all tend to be a little competitive. Just remember that this is for an amazing cause in a much needed time and anything we do will be a huge help to feed the hungry members in our community.